52 Boulez, P. le marteaux sans maitre. Universal Edition 7 x 9.5 Some water damage on cover and title page. 95 Haydn The Creation (Die Schopfung). Breitkopf and Hartel 9 x 12 Hardcover Conductor’s Score – Inquire about price. 96 Haydn The Seasons (Die Jahreszeiten). Breitkopf and Hartel 9 x 12 Hardcover Conductor’s Score – Inquire about price. 113 Kodaly Hary Janos Suite. Universal Edition 10.5 x 12 Cover taped; otherwise v.g. 170 Rimsky-Korsakov Scheherezade Kalmus 10 x 13 Pages browned. 188 Shostakovich Symphony No.9 Leeds Music Corp. 6 x 9 Slight water damage to top border. Reflections on the Nature of Marimba Music. After the defeat of China’s army by the British in the first Opium War, (1839-42) Japan, concerned with the possibility of a foreign invasion, adopted Dutch military music for fifes, drums and trumpets to discipline and train their Samurai warriors in western infantry tactics. This was the first western music sanctioned by Japan since the expulsion of foreigners in 1640. In 1875, Japan’s government introduced a nation wide public school music program based on an American model. By 1965, only 90 years after this official embrace of western music, the influence of Japanese composers began to be felt in western avant-garde art music circles [1.]. 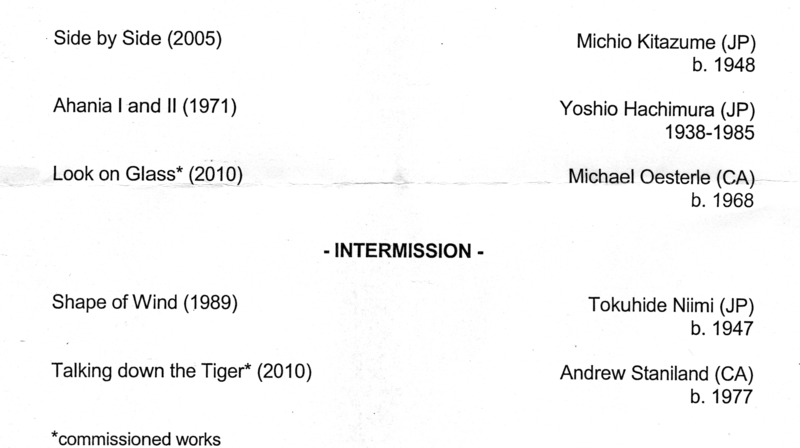 The programme above is from Ryan Scott’s first DMA recital, played in Toronto, Ontario on 22 January, 2014. Ryan’s DMA thesis will probe Japanese art music for marimba. His work on this project has been facilitated in part by New York City resident and former Keiko Abe student Alan Zimmerman. Alan gave Ryan access to his encyclopedic knowledge and massive library of Japanese compositions for marimba, dating from its inception as art music in the 1960s, to the present. Ryan anounced from the stage that prior to 1965, Japanese marimbists played arrangements of traditional folk songs and western classical music. Marimba virtuoso Keiko Abe (b.1937) convinced prominent Japanese composers to write art music for marimba and manufacturers to upgrade the quality of their instruments.[2.] Between 1965 and1985, more than 500 works of art music were written for marimba by Japanese composers and many of them are still performed today. I had thought to write a critique of Ryan’s performance, but instead,found myself musing over his announcement regarding Keiko Abe and Japanese composers. I began thinking about the marimba in North America. What follows is almost entirely anecdotal, but during a lengthy telephone conversation, Ruth Cahn, who has been in the middle of most things percussive for many years, confirmed most of my remembrances. Thank you Ruth. Nevertheless, I take responsibility for all errors and the opinions expressed. Founded in 1961, the Percussive Arts Society (PAS) today has a membership that includes percussionists from almost every university, college and conservatory in North America. Administered primarily by and for university percussionists, the PAS acts as a nexus for students, teachers, composers, performers and manufacturers, providing them access to school programs, pedagogic trends, new instruments and music. By 1980, a nascent group of educators and performers began to champion the marimba as a solo instrument and the popularity of marimba playing grew exponentially. Arguably the most influential marimbists was Leigh Howard Stevens (b. 1953). Stevens studied with Vida Chenoweth [4.] and later created an entire system for marimba playing. He devised a new grip, new mallets and a new marimba design, all complimensts to his vision. Stevens also wrote hundreds of etudes, and a vade mecum to disseminate his ideas. His work has influenced marimba composition and performance and has been adopted and adapted by marimba players throughout the world. A marimba provides melodic and harmonic components often lacking in all but a few percussion programmes of the past. In most major music schools, marimba studies have become the backbone of its percussion department. Importantly, this helps validate percussion studies within academia. Post graduate degrees, often unavailable to percussionists prior to the marimba’s ascendency, are today, the norm, even for students who eschew traditional instruments and specialize in solo marimba performance. Two major concertos for marimba were written before 1960: Paul Creston,1940 and Robert Kurka,1956. 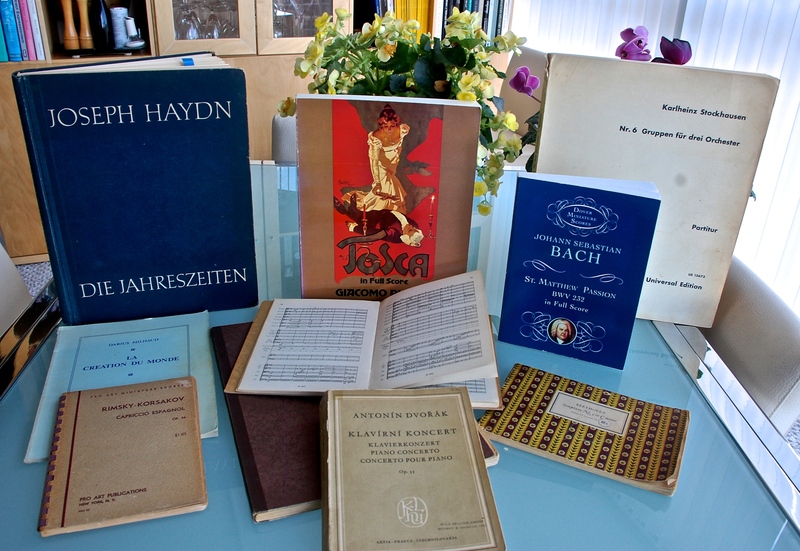 From 1969 forward, most concertos were being written by foreign composers. [5.] In 1987, John Serry completed a marimba concerto commissioned by Leigh Howard Stevens and other marimba soloists followed suit with commissions of their own. Unlike Japan however, only a small amount of solo music for marimba has been written by America’s art music composers. One of these, by Jacob Druckman (1928-96), is Reflections on the Nature of Water (1986) a masterwork, now almost thirty years old. Aside from the Druckman work, practically all pedagogic, ensemble and solo recital music has been and is being written by percussionists. A recent national marimba competition provided applicants a repertoire containing 15 compositionds, 13 of them written by percussion teachers. Their music has failed to make an impact on audiences outside percussion circles. It is commonly based on classical forms and structures and is heavily influenced by basic marimba technique or the latest fad. Their music also demonstrates the American percussionist’s preference for loud, fast, continuous and repetitious music. [6.] For example, soon after the appearance of Steve Reich’s Music for Pieces of Wood, in 1973, percussion students and teachers began writing pattern music and continue doing so. In the words of a professional musician and friend, “Most composers are arrangers”. I was impressed by Ryan’s lack of histrionics, all too common among players today, and the concentration of his mature artistry which allowed the music’s unique qualities to appear without his intervention. Michio Kiazume’s Side by Side is a congenial and equally virtuosic substitute for Xenakis’ Rebonds and was played with clarity and panache. I was delighted. Ryan is commissioning a select group of composers. One being a marimba concerto by Erik Ross (2007). On the program above, the work by Oesterle for marimba and koto is a welcomed addition to the repertoire. [1.] See Burt, Peter: The Music of Toru Takemitsu, Cambridge University Press, 2001. [2.] Many percussionists including myself, were familiar with the works of Keiko Abe before her first visit to North America in November,1977. Though impossible to quantify, her presence inspired many students to play modern music and encouraged marimba soloists to write their own original compositions. A detailed comparison of the grips, mallets and styles of Abe and Stevens and their effects on marimba performance would make interesting reading and a beneficial companion to Scott’s thesis. [3.] If one wishes to hear a large marimba orchestra playing typical Musser repertoire, one can purtchase the CD The Marimba Festival Orchestra conducted by Frederick Fennell and recorded in the Eisenhower Theater of the United States Military Academy in West Point, New York. The orchestra was assembled by Lee Howard Stevens and featured soloists Gordon Stout and Bob Becker. Resonator Records by Marimba Productions, Inc. 1999. [4.] The importance of Vida Chenoweth and her teacher, Clair Omar Musser, are worthy of attention. Vida Chenoweth ( b.1929), one of Musser’s students at Northwestern, played her first solo recital in Chicago in 1956. She performed concerts world wide until an accident prevented her from playing at her former level. She is a member of the Percussive Arts Society Hall of Fame. [5.] See: Conklin, M. Christine: An Annotated Catalog of Marimba Concertos Published in the United States Between 1940 – 2000. Marimba Concertos listed, chrinologically, alphabetically by composer, with orchestration, marimba size, date of composition, an interview and reviews, DMA thesis, University of Oklahoma, Norman, 2004. UM number 3134393. [6.] I sent trombonist/composer Vinko Globokar an ensemble improvisation recording. His reply, paraphrased, was, ” This is typical of American music. Continuous, repititious. For the trio improvisations, our percussionist brings only two or three small instruments. Our idea is to never repeat. Always search for new ways to make sound”. [7.] See Takemitsu, Toru: Confronting Silence, Fallen Leaf Press, Berkeley, California, 1995. Pgs. 51-57 contain Takemitsu’s thoughts on his use of silence and the concept of Ma. Six compositions by Robin have been recorded by Nexus: Remembrance, Lullaby for Esmé, and four arrangements of Toru Takemitsu songs for mixed chorus: Sakura, Will Tomorow, I Wonder, Be Cloudy or Clear?, A Song of Circles and Triangles and All That the Man Left Behind When He Died. A marimba solo, She Dances was completed in 2003. Robin is at present working on a solo requested by Toronto percussionist Ray Dillard. Robin completed Music for Soldiers, an arrangement for brass quintet and military field percussion of four historic songs associated with military history, The songs included are, Handel’s See the Conqu’ring Hero Comes, van Hagen’s Funeral Dirge on the Death of General Washington, the anonymous British folk song Pretty Girl Milking the Cow and Daniel Emmett’s Dixie’s Land. The Canadian Brass and Nexus premiered Music for Soldiers in the Glenn Gould Theatre. Songs for Soldiers was featured on the C.B.C. Television show Opening Night broadcast in February 2003. A recent composition is Dance Movements for Harp and Marimba (2000) written for the Toronto duo ArpaTambora – Sanya Eng and Ryan Scott – who commissioned the work. Dance Movements was written with funds provided by the Laidlaw Foundation of Toronto and premiered at the American Harp Society International Harp Convention in Cincinnati, Ohio by ArpaTambora. ArpaTambora has recorded Dance Movements and the CD is available at their web site. NB – the compositions listed above are available from the composer. During the 1970’s, Robin became interested in the large rope tensioned field drums in use during the 16th and 19th centuries. He began collecting historic fife tunes and fife and drum tutors associated with armies of that period. He also began to read and collect books on the history of military duties, campaigns and tactics so as to better understand the development of the drum and the lives of drummers prior to the 20th century. He has arranged more than one hundred historical tunes for various instrumental combinations and is preparing a book that will trace in melody and song the history of the Field drum from Renaissance England to the end of the Civil War in the United States. Robin was the artistic director of a critically acclaimed concert for the November 2002 Percussive Arts Society International Convention in Columbus, Ohio called The Drummer’s Heritage. The concert was a survey of drumming styles and music from the Revolutionary War in the U.S. to the present and featured field drum artists from Scotland, Switzerland, Canada and the United States, along with university, college and elementary school marching units. This DVD is a milestone in the documentation of snare drumming styles through the ages. Over two hours of live concert footage and an in depth interview of Artistic Director Robin Engelman by concert narrator Dennis DeLucia. The sound quality is superb and you’ll see close up the technique of some of the greatest drumming artists of today. Major solos by the legendary John S. Pratt – author of Fourteen Modern Contest Solos, Nick Attanasio “ bass drum legend, Jeff Queen – star of Blast & DCI icon, Jim Kilpatric – Scottish drumming grand master, Marty Hurley – Drum corps master teacher and Alfons Grieder – Basel drumming master. The Colonial Williamsburg Fifes & Drums, Rope drums and music from the American Revolution – The Camp Chase Fifes & Drums, Civil War Music specialists with appearances in the films “Gettysburg” and “Gods and Generals” – Canadian Associates Rudimental Drumming Excellence(C.A.D.R.E.) senior masters of Canadian corps style – The Peel Regional Drum Corps & Pipes, perennial top ten in world pipe and drum competitions – Americlique, Swiss, Basel style ensemble – Bethune-Cookman Marching Wildcats, Show Band Masters and stars of the movie “DrumLine”- The Oakvillage Marching Percussion Ensemble – a junior band from Houston, The University of North Texas Drumline, multiple PAS champions and a Grand Finale with all the artists performing together. PAS Drummer’s Heritage Scholarship Fund.